Around here, October feels a lot like March in reverse. The month eases you in, docile as a lamb, but promises to bite you on the back end. Hope you took advantage of one of the more gentle weekends this month has to offer. I enjoyed autumnal splendor down in rural Pennsylvania at that perfect moment when lush green foliage begins to mix with brilliant red, orange, and gold. Migration appears to be just about over in that area, as the only warblers I spotted were a lone Palm Warbler and a handful of butter butts. Corey’s Best Bird of the Weekend was a close contest. He couldn’t decide between a Bobolink on the barrier beaches of Queens and the Eurasian Wigeon on the East Pond of Jamaica Bay. 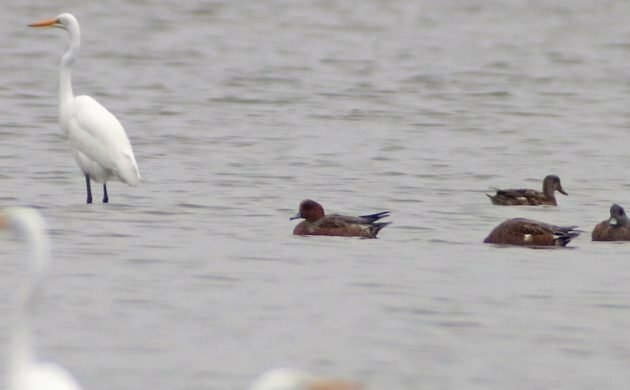 He flipped a coin and the wigeon won! Marbled Murrelets here on the Olympic Peninsula. Red-necked Grebes and Western Grebes, too! A Great Sparrowhawk in some gardens in Addis Ababa. My god it was enormous! I couldn’t get out birding (deadlines!) so a best bird came to me: A Peregrine Falcon picking off one of the neighborhood pigeons.